Police are looking for willing volunteers to help ensure elderly and vulnerable people are kept safe during the winter. ‘Snow Angel’ volunteers will support the police with clearing paths of heavy snow and ice and deliver essential provisions to those who are less mobile. 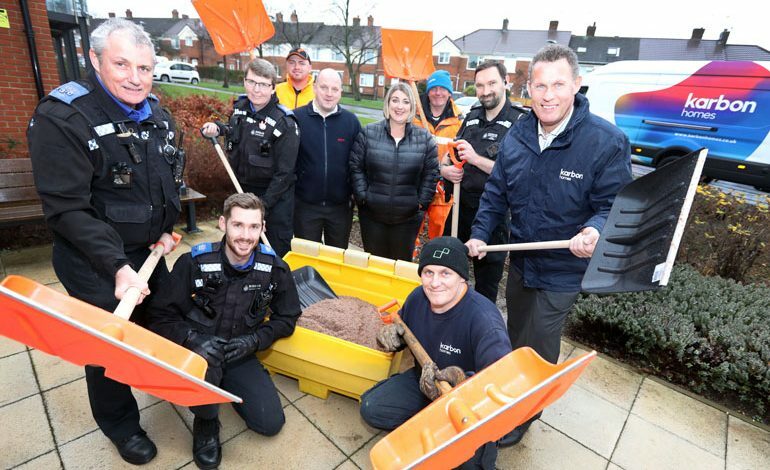 Durham Constabulary have joined forces with housing association, Karbon Homes, who have supplied snow shovels, as well as additional salt bins across the area where it operates. The project which is now in its eighth year in Chester-le-Street and the surrounding villages will this year be extended to Consett and neighbouring areas. PCSO Christine Taylor from Durham Constabulary said: “It is important that we look out for the vulnerable in our communities, especially in bad weather when people become cut off from shops and other local services. “The Snow Angels initiative aims to build upon the excellent work that was carried out during the extreme weather earlier this year and provide structured support such as snow clearance, food parcels, and extra grit bins. Paul Hadden, Community Involvement Officer at Karbon Homes, said: “Many of our residents are elderly and vulnerable and our aim is to ensure they stay safe should we experience heavy snowfall and extreme weather conditions. Batley’s Cash and Carry on the Drum Industrial Estate has also pledged its support to the project by offering to provide provisions for distribution in the Chester-le-Street and Pelton areas in an emergency. Volunteers will need warm clothing and a shovel and in the event of heavy snowfall, helpers will be contacted and asked to help clear paths and deliver provisions.